Over the long weekend, my fiance and I drove up to Napa, where his mom lives, and hung out there and in San Francisco for a couple of days. 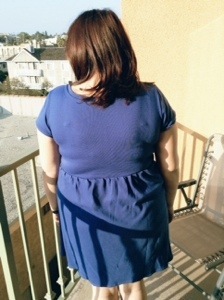 It was fun and relaxing and gave me a chance to get a few pictures of my latest dress, the Moneta by Colette Patterns! I absolutely love this dress. It is exactly the kind of silhouette I love with the ease of a knit. Plus it is fast to sew! We took these pictures by the dock in Vallejo while we were waiting for a couple of friends to meet us for lunch in Napa! 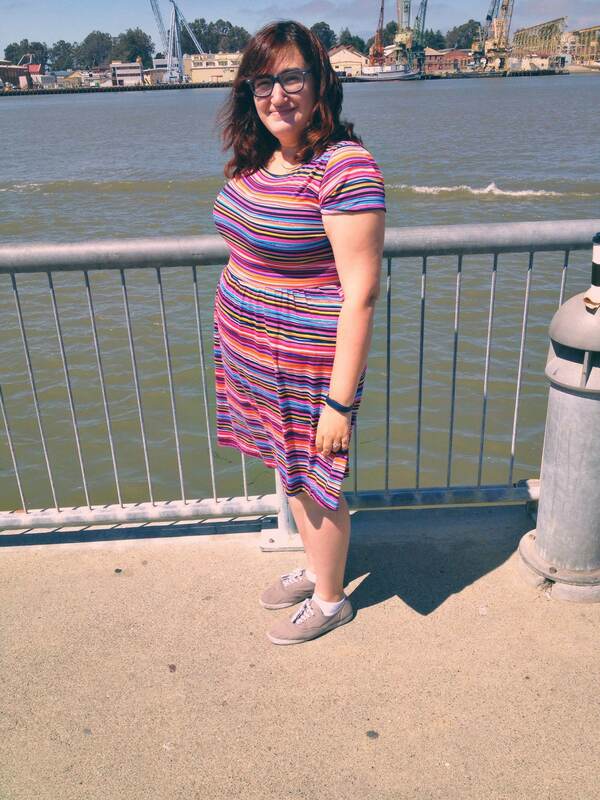 It was really windy and really bright, so my face looks kind of weird, but at least you can see the dress moving! This is actually my second Moneta. My first is so adorable you guys. It is a two sided almost sweater knit type fabric, and one side has stripes and one had polka dots, so I did the top in stripes and the bottom in polka dots. It is the best! Except when I washed it, it frayed like crazy on the hem, so I had to cut it off and re-hem it, and now it is super short. 😦 I might try to make one like it with some type of jersey some day. Sigh. Size-wise, I am on the high end of the XL and the low end of the 2x, but when I compared the bodice to my lady skater pattern, which I knew fit, the XL was closer, so I went with that! 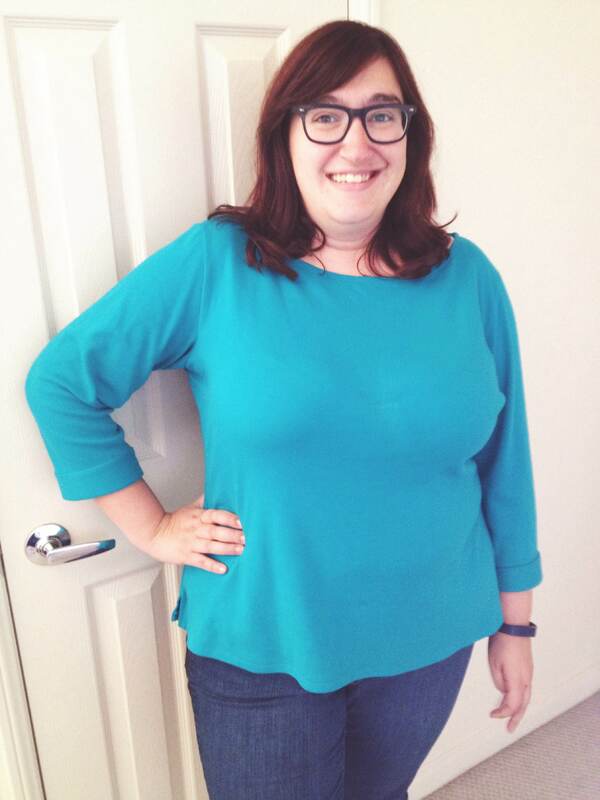 I’m glad I did – it fits really well up top and I like the length of the bodice a lot. The fabric is from Jo-Ann’s – I went in for a couple of notions and I found this stripey fabric and it was on sale for only $5/yard and I really loved the colors. It is really soft and nice, and the dress is so comfortable! For the first one I struck out on my own, but for this one I followed the sewalong which was super helpful, especially when it came to the elastic attaching. I am still going to need some work on it, but this version was way better than my first. Also, Devon helped me a few times at Sew L.A. and she was super helpful and nice so I liked learning from her! I also made a third version during the sew along which I hope to share shortly! So that’s it! 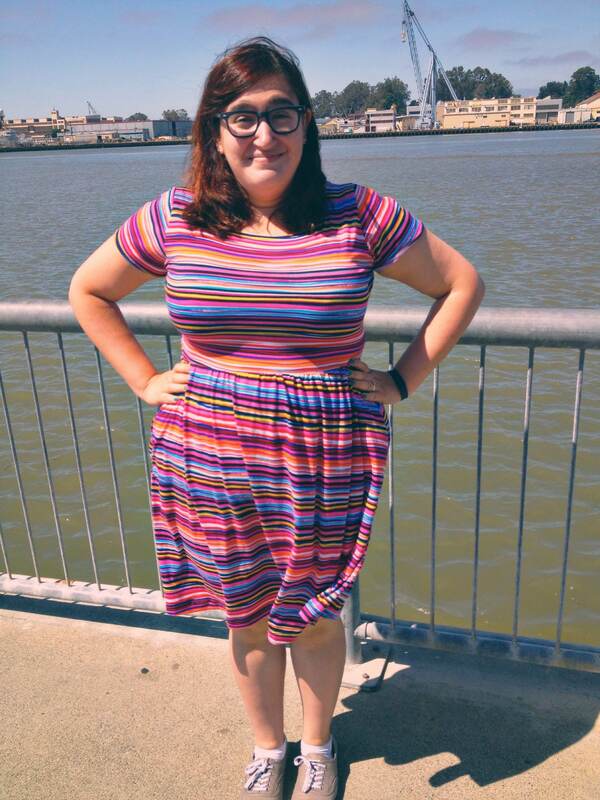 I really love this dress and plan on making a zillion, hence the title of this post. I’ve actually been doing a fair amount of sewing, but haven’t taken any pictures. My fiancé and I are in San Francisco and Napa this weekend, and I brought one of my new favorite dresses, so hopefully we can snap some pictures while we’re here! In the meantime, I have about 3 weeks left of summer before we take a trip for a friend’s wedding, after which I’m going straight to a conference for work, then my parents are coming in town for a week, and then my summer break is over. So I thought I should make a plan to get as much summery sewing as possible done before that. I’ve been using a sketching program on my iPad to make a croquis and draw out what I’m planning to make. Please do not laugh at my art skills. I want to make a couple of summery dresses, and I think the staple dress will be perfect because it is quick and the resulting dress will be nice and light for how hot it’s been. To be super efficient I thought I could cut two at once! 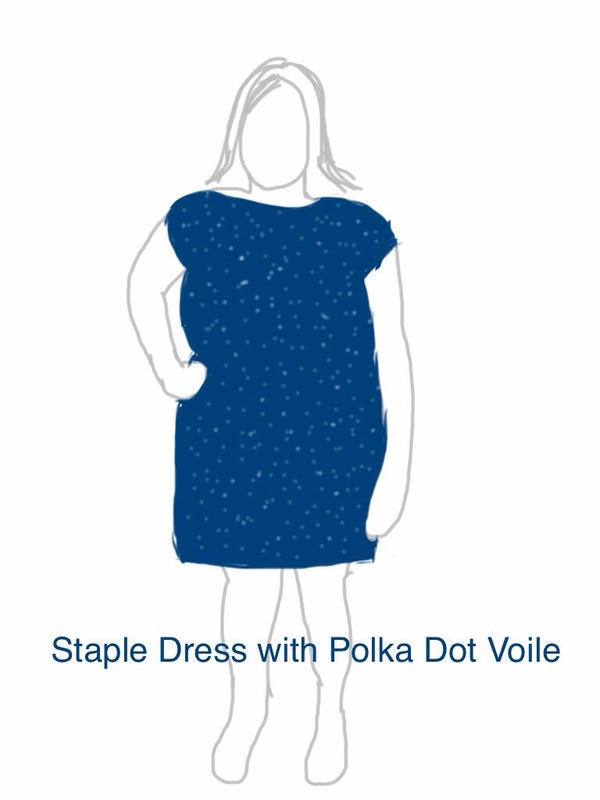 I have a navy and white polka dot voile from Michael Levine and a blue and white striped linen from The Fabric Store, which will both make perfect summer dresses. 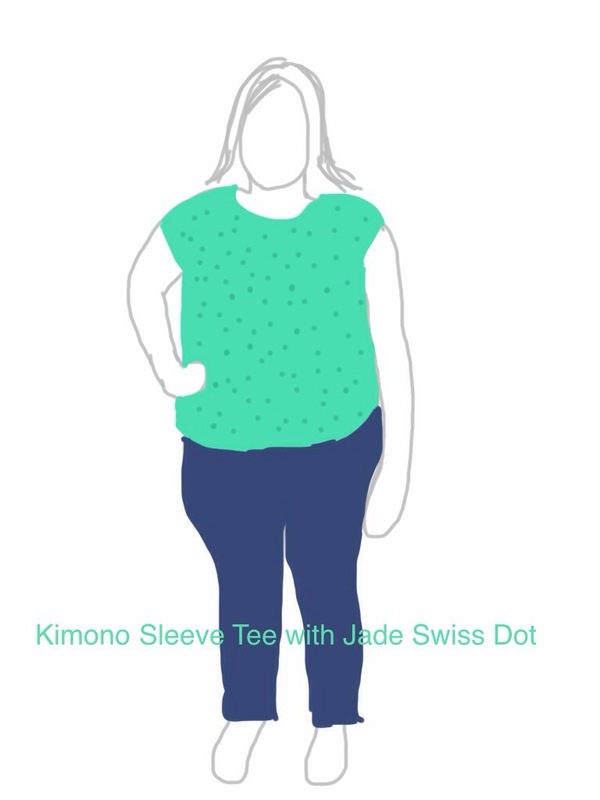 I’ve been wanting to make a kimono tee pattern, and was thinking of drafting my own, but then realized I could just shorten the staple dress! I’m planning to do that and make it up in a jade Swiss dot from Mood Fabrics (that I got with a gift card from my friend Lacey for my birthday! Thanks, Lacey!). 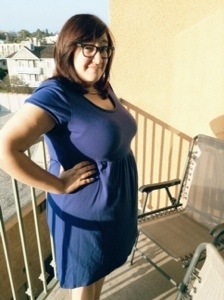 I also have a really nice purple jersey from The Fabric Store, and I think it will make a great tank dress. It’ll be nice to make a few knit dresses with looser tops, after the Moneta rampage I’ve been on (pictures soon!). If I can get all of this done by August I will be really happy and amazed. Then it will be time to think about what I’d like to sew for Fall! 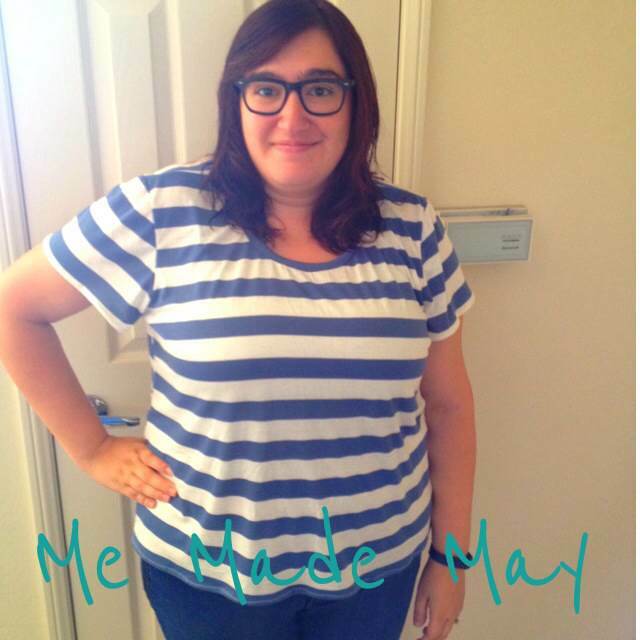 Me Made May Reflections, plus some other things! 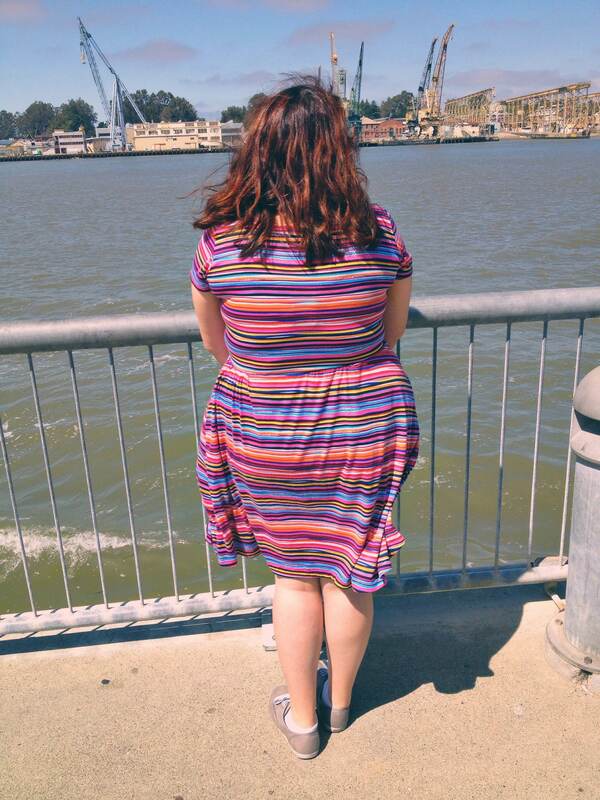 This dress is a Staple Dress which I never blogged because I made one previously! It is made with a gorgeous voile that I got from Sew L.A. I wore this dress on my birthday! I guess I’d had in my mind that this was a special occasion kind of dress, and while it is super awesome, it is also really comfortable and is casual. I really loved wearing it and will try to more often! On my birthday I decided to take the day off an treat myself to something nice. 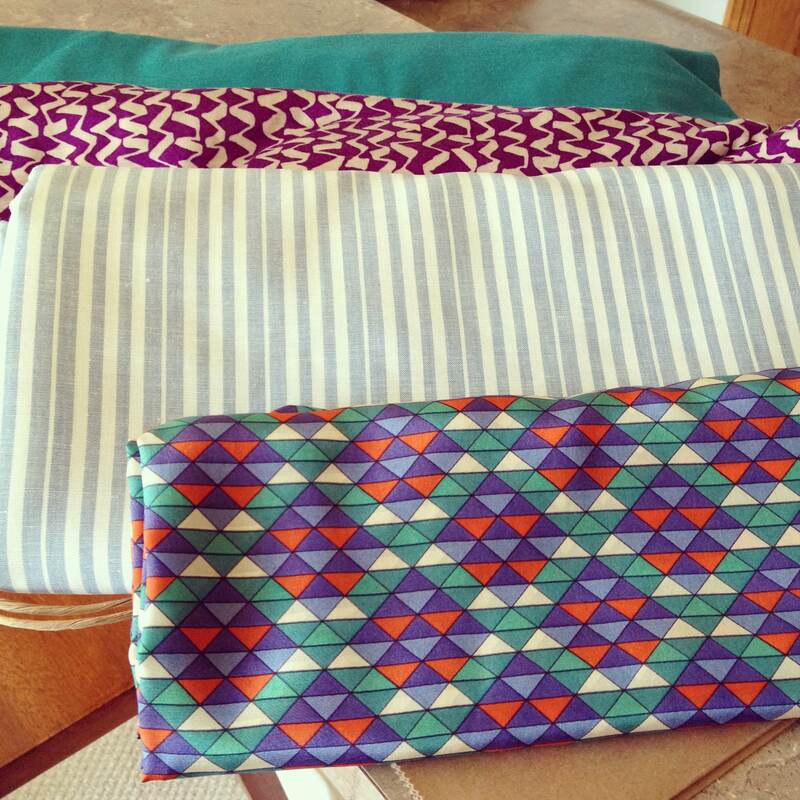 So, I made my first visit to The Fabric Store and picked up these beauties! I seriously wanted to buy every single thing in that store, and spent ~2 months of my sewing budget in there. The top two are jerseys – the teal is just the most perfect color, and is actually a wool blend. I think that will become a Moneta (I’ve actually already made one and I love it so much and will post pictures soon)! 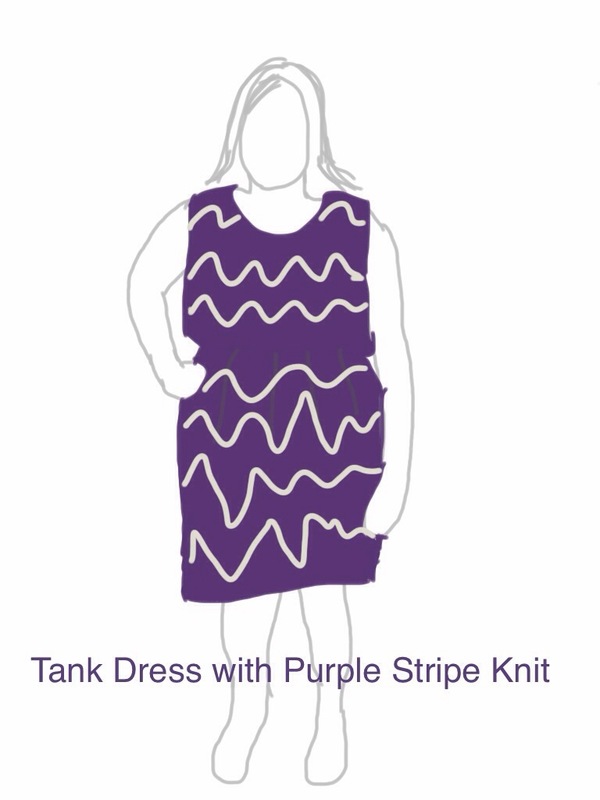 The wavy purple will likely be a dress as well – probably a tank dress because it is very lightweight! 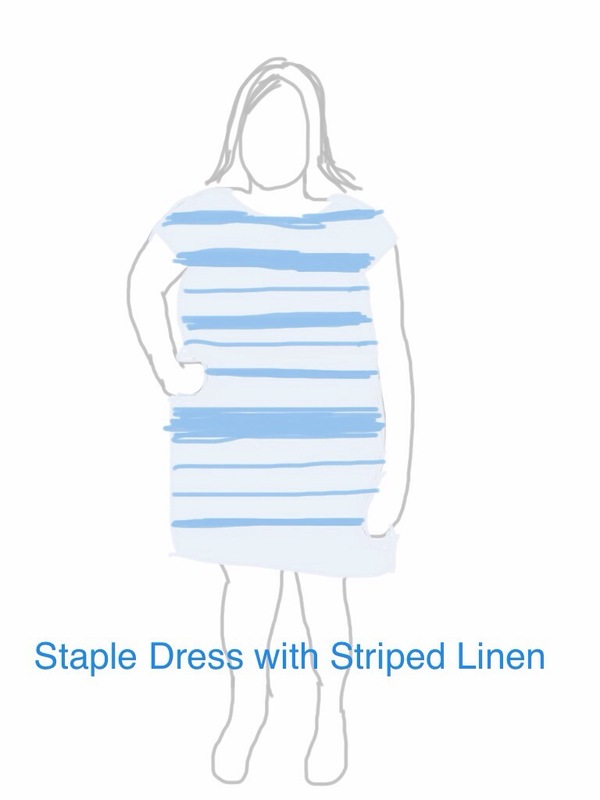 The light blue stripes are linen – I am thinking a fit and flare dress that will be perfect on the hot weekends coming up! And the front is actually silk! My first silk! It is just the most beautiful fabric ever. I think I will make a kimono sleeve blouse with it – super simple since the pattern is a lot. I am scared but also excited to sew with silk for the first time! One thing I got a lot of wear out of during the month was my polka dot lady skater! 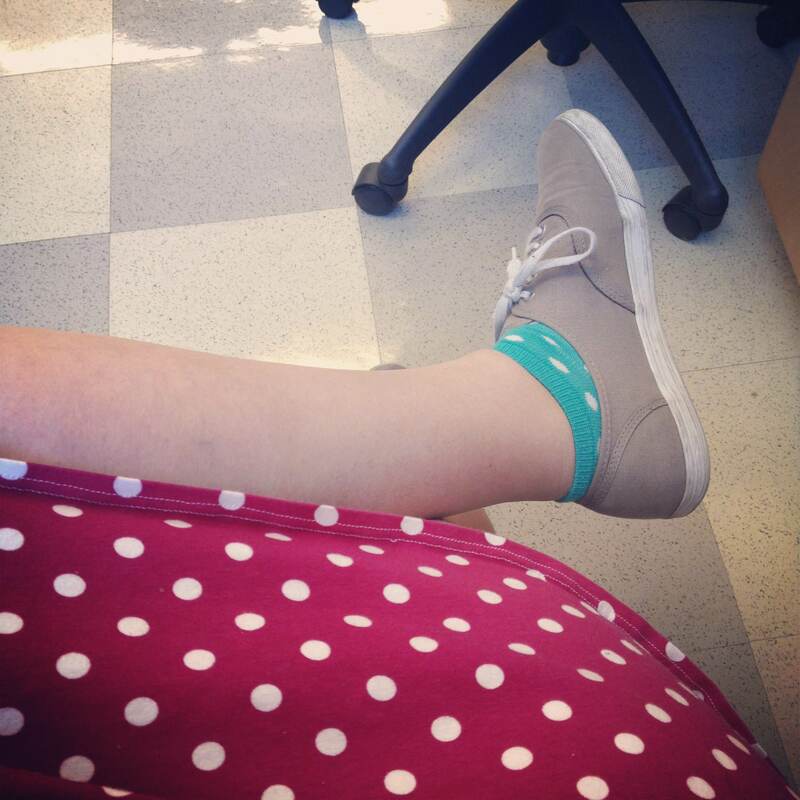 This day I wore it with polka dot socks, because you just can’t ever get enough polka dots. It is just so easy to throw on and fun and comfortable. I think that was the main take away from MMM for me – I just like being comfortable, and for me that means mostly knit dresses and t-shirts! So before next time I want to have a lot of those made! And maybe eventually trying my hand at pants/jeans since I will need something to wear with the t-shirts 🙂 I did notice that I only wore a skirt once. I am not sure if this is because I am just not a skirt person or because I never feel like I have anything to wear with them. I will have to think about that! 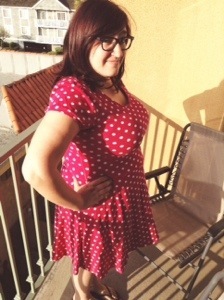 I also made a convertible dress! I’ve had this ITY knit sitting around for a long time (I think it’s from Fabric.com?) and I wanted to see how easy it would be to make one up. There’s a bunch of tutorials online but I ended up mostly using this one, which was very clear. The only think I did differently was attach the tube top part directly to the skirt, and omit the waistband. I didn’t have quite enough fabric to make the scarves as long as would be best, but overall I think it worked! I’ll probably never wear it because the wrong side of the fabric shows, but it really was just to see if I could do it in a reasonable amount of time. Why, you ask? Well, I am strongly considering making these for my bridesmaids for my wedding in February. I think they would be fun because they could switch up how they wear them. It took maybe 3 hours to make from pattern drafting to sewing (I did most of it on my serger), and I think it would be pretty awesome if my bridesmaids could wear something I made! Either way this would be a fun dress to have around so I might make one for myself in a different fabric eventually! 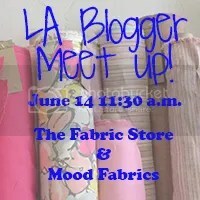 Lastly, I will be going to the LA Blogger Meet Up on June 14th! I’m super excited to meet some fellow LA sewists and go fabric shopping with you all! Ok, that’s it for now! This summer I am hoping I will be sewing up a storm! Coco Top (And MMM’14 Week 1 Round Up)! A few weeks ago I made Tilly and the Buttons great pattern, the Coco top! This is a super versatile pattern with a classic, Breton top shape, that I really like. I was pretty much treating this as a wearable muslin, as this fabric is much stretchier than what is recommended. However, I still ended up with a very wearable top. I cut a straight size 8, and I actually think I could possibly go down a size, especially if I want something a little more close-fitting, more like a Breton top. But this top is super comfortable as is. I thought about adding a patch pocket (and even cut one out), but decided the placement would be awkward. Where do people with large busts put pockets? Or should I just avoid them altogether? I think a contrasting pocket would be so cute! I think one advantage to using a ponte as suggested would be slight smoother lines in the back! I think I might also want to narrow the sleeves a bit. I love the neckline, though! Side split! Such a cute detail. It would probably look nicer in a stable knit. 🙂 Overall, I think I will making plenty of these in the future! I also wanted to give you a Me Made May Round-up. You’ve seen my outfits if you follow me on instagram! 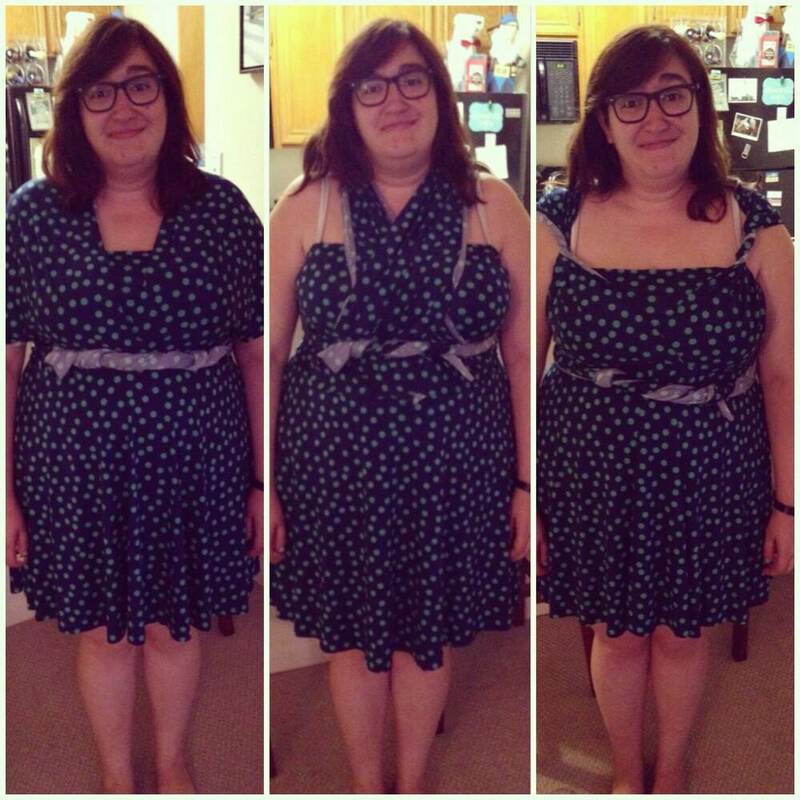 I had pledged to wear three me made items a week, so here are the two outfits other than the outfit above! Both of these are knit scout tees and you will notice that all three of my me made items this week are knit tops. Definitely a staple of my wardrobe and something that I will be making a lot more of! 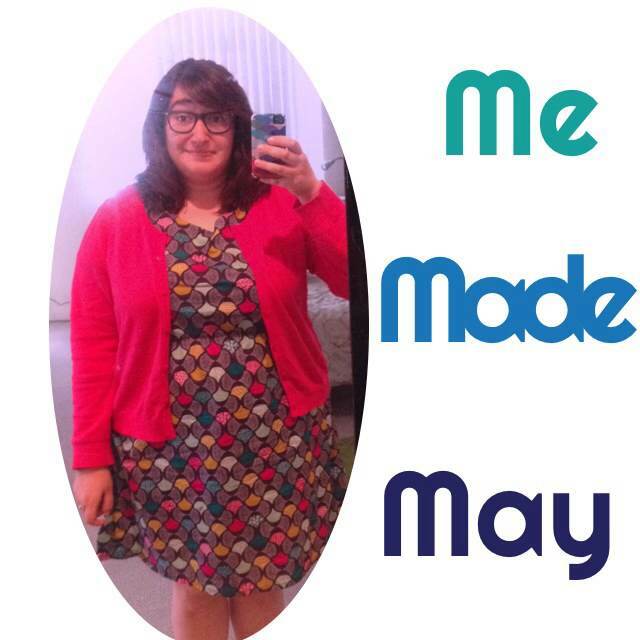 I am one day late, but I’ve decided to join in Me Made May! I remember reading all of the blogs last year that participated and thinking how fun it would be to participate next time! I don’t have a ton of me mades so I’ve decided to pledge to wear me made clothing 3 times a week. Hopefully by this time next year I can wear me mades every day! 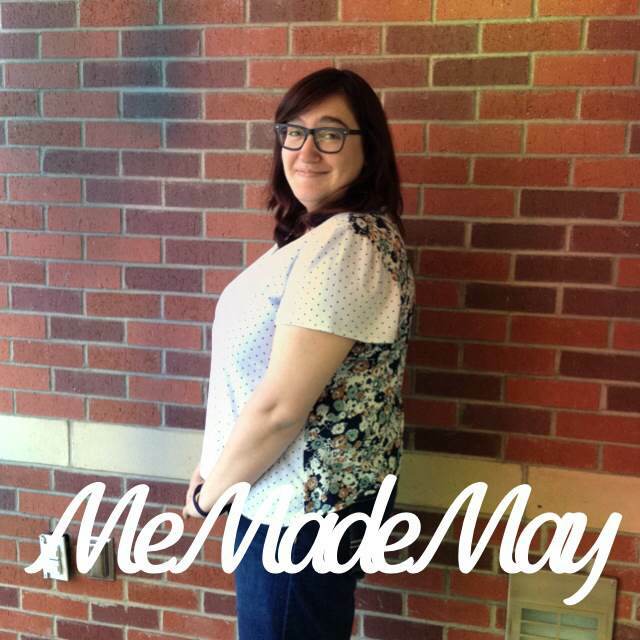 I, Karin of Dots, Stripes, and Florals, sign up as a participant of Me-Made-May ’14. I endeavour to wear one me made item three days a week for the duration of May 2014. I will be posting my outfits on instagram, and then doing round-ups here. Thanks for following along! As mentioned in my previous post, one of the main things I want to make this season are knit dresses that I can just throw on whenever. This was actually one of the main reasons I wanted to get serger! 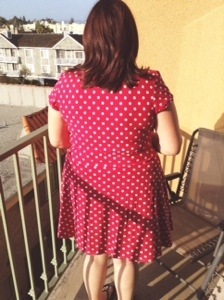 I decided to try the Lady Skater by Kitschy Coo because there were so many great versions on the interwebz and it’s a shape I really like to wear and it goes up to my size! 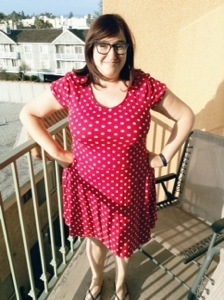 For my first version, I cut a straight size 8 from this adorable bright pink and white polka dot jersey from Girl Charlee. Over all I love it, and I’ve already worn it a bunch! There are a few things I wanted to alter though. 1) I think the waistline is too low – it’s actually hitting me where I am the largest, so on the next version I raised it 3.5″. 2) Like pretty much everything I’ve ever made (I should probably have learned my lesson by now) I need a narrow shoulder adjustment. In the next version I did a 0.5″ narrow shoulder adjustment. 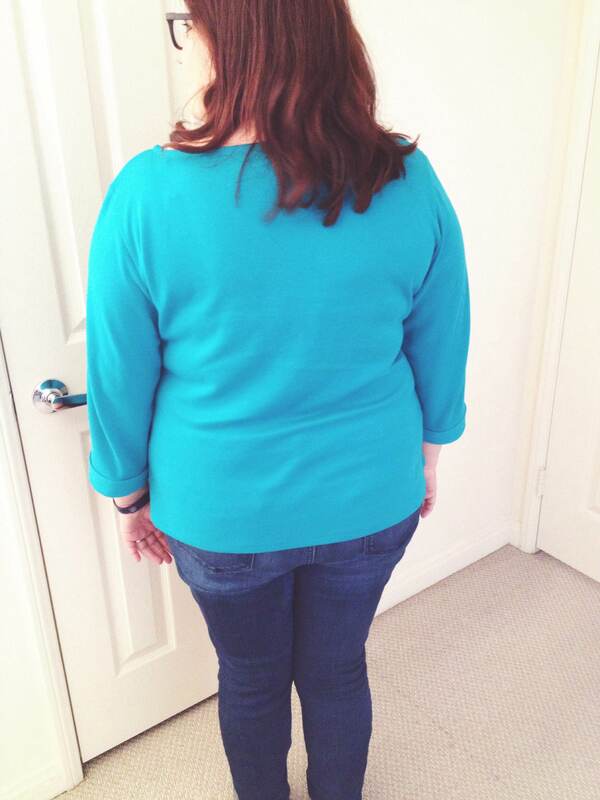 I also have a lot of bunching in the back, but I hoped that will be taken care of by raising the waistline. For my second version, I used a jersey from Joann’s Fabrics. Along with the alterations mentioned above, I decided to try a drindl skirt. I really like that style and figured it would also use less fabric! It turned out a little weird though – I don’t think I gathered the skirt very well. I also didn’t think about the fact that raising the waistline to a narrower part of my body meant that I should also take it in a little bit. I’ll have to fix that next time! 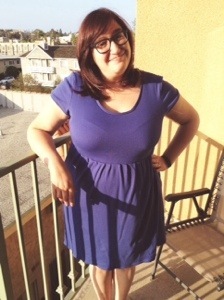 So this dress isn’t as fitted as planned, but it is still super comfy! I think I’ll get a lot of wear out of it this summer. 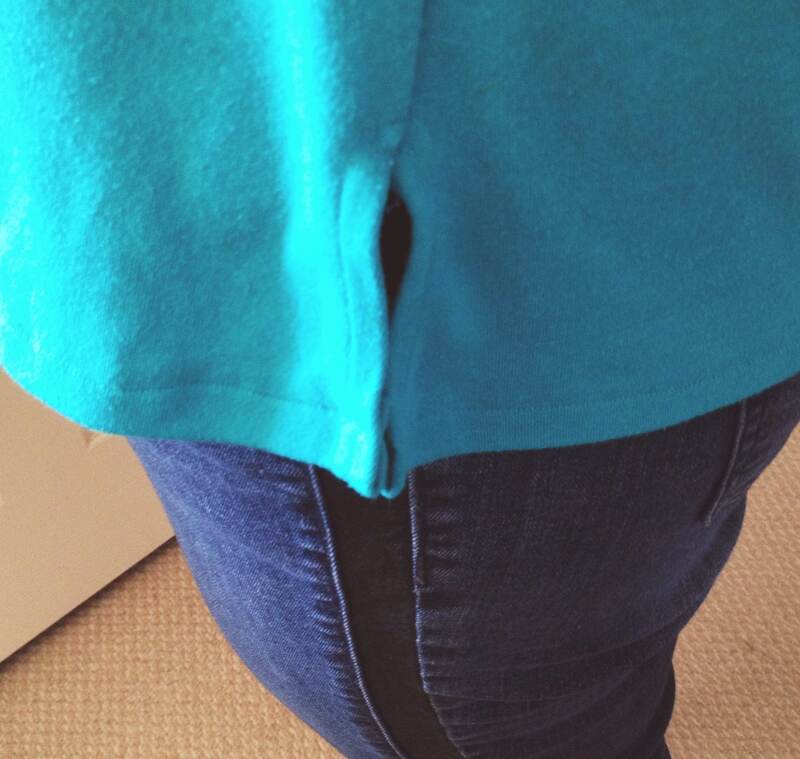 I’m still getting a lot of extra fabric in the back, so maybe I need a sway back adjustment? I will definitely be making more of these, although I think I will switch back to the circle skirt the patter comes with. The new Moneta from Colette Patterns has a gathered skirt so I think I’ll be trying that for my next one! Overall, these are two simple and nice dresses that will continue to get a lot of wear, and they sewed up really quickly! Definitely a nice way to get back into sewing after a long break! Hi all! I’m back! Kind of. The year so far has been officially insane. I am just really busy with multiple jobs, job searching, volunteering, and wedding planning. Plus trying to have a social life. Things have slowed down just a bit recently, and I’ve actually had time to do some sewing and picture taking! Before I show you what I’ve been working on lately, I thought I’d show you what kinds of things I’m hoping to make in the next few months. One thing I’ve noticed as the warm weather approaches is that I don’t have a lot of T-shirts I actually like. I have a lot that I wear under sweaters or to bed, but not a lot I feel comfortable in without something over it. So, I’m planning to make a few! I think I will mostly use the Scout tee, which I have used previously. I also recently made a Coco (to be blogged soon!) and have the Renfrew pattern as well (although I think I will have to grade up in order to use that one) which I am planning to use. I’d also love a raglan t-shirt pattern if anyone has any ideas! I’ve been teaching this semester, which means I’ve had to dress a little nicer than I normally do, and it turns out that 6 years in graduate school and 3 years as a postdoc leave you with very few nice blouses. So I’d like to make a few! Honestly, I don’t have to get too fancy, so I was thinking of using the Scout tee again, but with some nice fabric – maybe challis or some nice voiles. I’d also like to make a few tunic-type tops. If anyone has a good idea for a pattern there, I’d be happy to hear about those as well! I recently bought this super pretty floral stretch cotton sateen on a whim, and am planning to use it to make a nice fit and flare dress. I am going to have a lot of fancy-ish events in the next few months for my wedding and other people’s weddings so hopefully I will get a lot of use out of it! 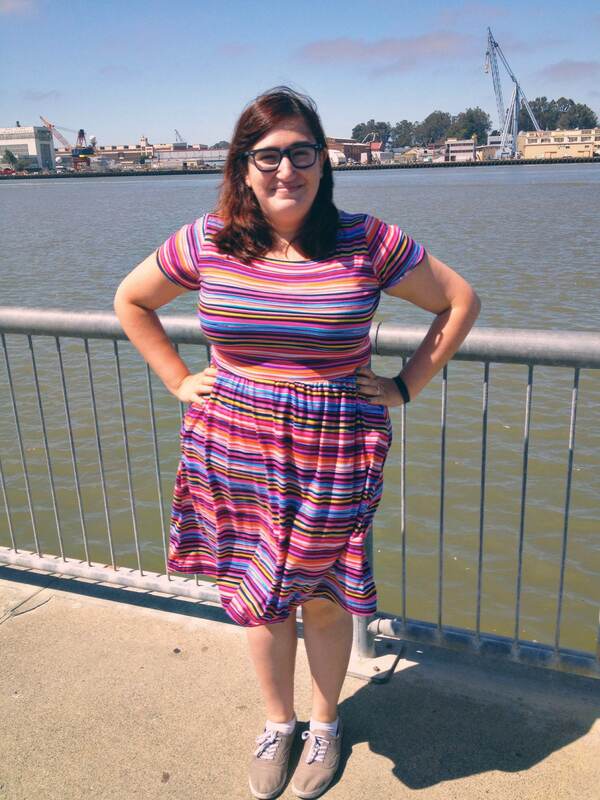 I don’t have a pattern yet, but I am thinking possibly the Emery Dress? 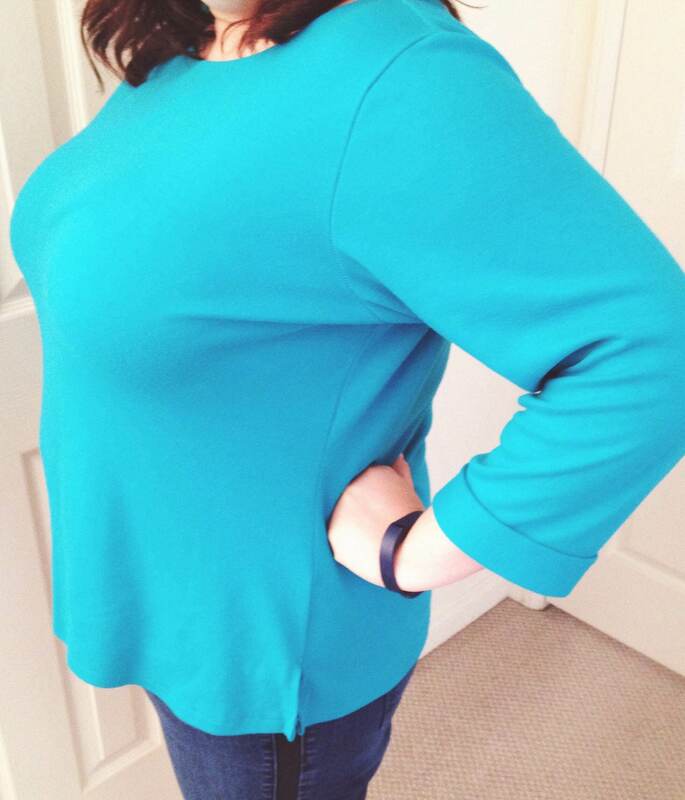 I also have a peplum top pattern, and maybe I could use that and just extend the peplum into a skirt? More research needed! As it turns out, knit dresses are pretty much my go to “I just want to be comfortable and cool but still look nice” clothing item. I have a fair number in my wardrobe already, but I’d really love a few more! I am planning to use the Lady Skater (I’ve made two already and will be blogging them soon!) pattern and the new and beautiful Moneta pattern to make the knit dress wardrobe of my dreams. I’ll hopefully be back over the weekend to show you what I’ve been sewing up lately!